You can find Thailand’s Best Street Food at bookstores around Asia and on Amazon. This is a guide to where, how and what to eat at the best street food stalls in Bangkok. I stuffed my face for a year to get the most accurate information. Inside you will find reviews of each venue organized by neighborhood and food category, information about special menu items, different versions of the same dishes, available side dishes and beverages, illustrated maps, and a Thai phrase guide. 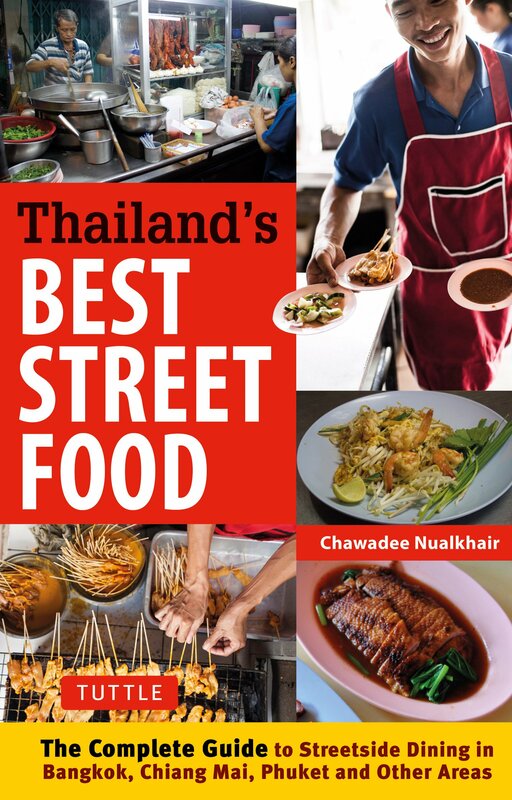 I have a very fine copy of “Bangkok’s Top 50 Street Stalls” available…..if anyone is interested pls email me for details. Could you let me know where I can still grab a copy of the bangkok’s top 50? Hi SS, apologies for the late reply. Bangkok’s Top 50 is unfortunately out of print. Sorry! Are the top 50 Bangkok food stalls included in your Thailand’s best of street food? If not, will you publish Bangkok’s top 50 as an eBook and sell it through amazon in the future? A fan trying desperately to get your Top 50. Is it possible to get it from you directly? Amazon seems to charge a bomb for it. I’d love to grab a pdf version. Happy to pay the same price for it as the print version! Let me know. Thanks!! I am in Australia but can give you a Bangkok postal address if that is easier. Thankyou! I’ve been reading online for weeks in preparation for a trip to Thailand in May and finally stumbled across your blog. I can’t believe it took me so long. I know that you must be constantly deluged with compliments, but you are a fantastic and gifted writer. And also ADORABLE, based on one of your videos. I have bought your most recent book, and am so disappointed that you don’t do food tours. I am nevertheless a new fan. Thank you, that’s really nice! I’m afraid I don’t update as often as I should and people sometimes think I’ve abandoned the blog. It’s great to get good feedback! I’m going to be in Bangkok in less than two weeks so I’ll miss your book. I checked on amazon and it’s only available for preorder. Is there any way to get an advance copy?? I’ve been told copies of the book are available at the Asia books at the airport in Bangkok. So hopefully you can get one there? I’m sorry it’s out so late in the states! Hi, My boyfriend and I will be in Thailand in February, leaving back for the US on the 23rd – we’ll miss your new book by a day! Is there potential to purchase an advance copy or will it be available for purchase sooner in Thailand? Thanks! Hi Stephanie, I THINK it’s available on amazon right now. Fingers crossed! I’m afraid not, unless you come to Thailand! Here, it’s available at Asia books and kinokuniya. My husband and I will be in Bangkok from Aug 10, 11 and 12. Would you consider giving us a food tour anytime during that time? If not, is it possible to purchase your book and have it at our hotel? Thank you so much! Hi, I’m so sorry, but I’m in the US at the moment and won’t be able to give a food tour or send a copy of the book to your hotel. A good person to contact for a food tour would be Chin at Chili Paste Tour. Sorry again! I loved your book and i’m a native Thai!! Thanks for writing it! Thank you! Apparently a new one is coming out in October! I woud love to buy your book , I am in Bangkok but I couldn’t find it . I went to asiabooks in central world . Where could I find it ? Hi Melanie, I think they are out of stock now. Where are you staying? Hi, the problem with selling a PDF copy of the book is that I have no idea what to charge. Unsure what people think the fair price would be. Sorry! Hi, I am also interested in a pdf version, is it out already? Hi Ana, if you really are interested in a pdf version for 400 baht, I’ll shoot over an email to you. Hello, I’m also interested in your PDF version. For some reason, Amazon.com won’t ship your book to my address in Canada and Amazon.ca doesn’t carry it. Leaving for Thailand in just over a month so concerned that the physical copy might not arrive in time before I leave. Hi Jason. I don’t sell PDF versions of my book yet. You can buy the book directly through my website if you like, and I will try to get the copy to you as soon as I can. Or, once you get into Thailand, you can get a copy of the book at the airport or Asiabooks, most reliably the one in Emporium. Hi, I’m currently visiting in Bangkok, staying around Thonglor. Where can I buy a copy of your book directly? Thanks. Hi, thanks for your interest! You should be able to get a copy at Asiabooks at Emporium. Let me know of you have any problems. Thanks again! Ok great! I should be expecting it then! Btw I am moving there for a pastry internship. I will be interning at the JW Marriott Bangkok. So while I’m there I want to experience as much of the local food as I can! You’ll find lots of interesting things right near you! I am sooo excited about getting your book for my soon to come travels to Bangkok! I will be living there for 2 months and I can’t wait to try all the stalls listed in there! I ordered directly off of your website here, when should I expect it to arrive? No, it was Seattle Washington USA. Order was placed on Dec 9th 2012. OMG just went I was about to depart to Msia at the Suvarnabumi Airport, I chance upon your book, flipped through it & fell in love with your style! I didn’t buy it then, rushed to check in departure hall. THEN announcement *flight delay 10mins*. I rushed out of it & went to grab your book! made it to my plane just in time! Thanks Tammy! I hope it’s useful to you. I sent you an email a few days ago. Thanks for your interest in the book. Hihi, I just bought your book but am wondering if you can send me a pdf version? You can confirm it with me via my email before sending it to me. Thanks! I haven’t tried any Thai cooking schools yet. Good idea though! I’m sorry Lisa! I will contact Rama Food immediately. Of course! I hope it proves useful to you, and that you have a great time exploring! Love your book! Can’t believe it, left it at home and am now in transit to Bangkok. Any chance I can get a pdf emailed so I can follow your awesome recommendations on my ipad? Thanks So much! hi. im really excited about your book. i’d like to order a copy to be sent to the philippines very soon. would it be possible to ask for an autograph (or even a small dedication)? also, i read from one of the reviews that you concentrated in only 5 areas in bangkok? i really hope that in your next edition, you would include also the stalls inside Or-Tor-Kor market near Jatujak. Hi, I’d be happy to write a dedication! If you’d like to order one, please feel free to order through this site and I will autograph it. The next edition will deal with, I hope, all of Thailand. We will try to address Bangkok too! Hi, thanks for the book. It’s stellar and so user friendly. If I could make a suggestion for your next edition, I wish the maps were a little more even. I appreciate the creativity behind it, but I still had to countercheck with googlemaps for a precise location. 🙂 Nevertheless, it’s one’s best companion in exploring the best of BKK’s street food. I really admire the love and effort that went into this book. Hi Jules, thanks for all the great suggestions. I will definitely keep these in mind for the next book. As for the PDF, I’m afraid I can no longer do that, but am happy to email suggestions. To start with: while Bangkokians no longer like Kor Panich and prefer Mae Waree on Thonglor, I like the mango sticky rice on Soi 38 the best. They offer both ok rong and nam dok mai mangoes. Also, I’d like to invite you to come for the Masskara Festival here in the Philippines this 3rd week of October. It’s a foodie city I tell you. Hi. I read the thread of comments here and I was pleasantly surprised that you have a pdf version. I’d like to inquire if I can purchase a copy of it as supplement to your book? 1. I think it would be good to have a main map of Bangkok with all the 5 areas placed inside or better yet, a standart MRT/BTS map on where the 5 areas can be found. 2. I feel it would be nice to include a couple of pages on the topic of “Shell Shuan Shim” and how Bangkokians view this. And if some of your stalls have this sign. 3. Though I am happy to see some new dessert stalls in the current edition, I was wondering where I can get the best mangoes-and-sticky rice? is it still in Kor Panich? God Bless on your next edition! HI, Just bought the book and can’t wait to do a food trail on it. Love your maps but I think it will be much better if your next version should have maps of both types. one the colorful sketchy one and the other should be aligned with google maps. It will be great if this book comes with an ipad/iphone app that can pinpoint the exact location so that it is easier to track and navigate. By the way, do you have a pdf version of the book? as it will be much easier to carry along in the ipad and to bring up google maps together in it. Can’t wait to try Oyster Omelette and so many goodies.s. Yeah.. Will definitely recommend this book to the rest of my friends. Hi, thank you for your message. I really appreciate your taking the time to make suggestions — I am definitely looking into these (especially the issues with the maps) for the second book. I do have a PDF version. I can email you if you are interested. Thanks again! Hi, Thanks for the prompt reply. Definitely will be interested in the pdf copy so I can just put everything into the ipad. So please email me the copy if possible. On another note, perhaps you can also tweak this site to accompany your 2nd edition so that it will for instance showcase the various stalls. Readers who follow your guide to these places can perhaps then actually click on the like/dislike or even give it stars plus comments. I am sure Food is something whereby everyone feels a connection with Bangkok. If the reader/food sampler can input their nationality before this. It will also provide a good database as in which type of thai food will appeal to people from each nationality and this can haha, give you enough information for your 3rd / 4th edition??? Haha, I am just so thrilled that I am lugging this book for my bangkok trip. Great effort there! Keep it up and do come up with then 2nd edition soon. Hi, I love reading your blog! My husband and I are going to BKK in a couple weeks and we’d love to have your book with us while we’re there. I saw someone asked about getting a PDF version a few posts down. Would it be possible for me to buy that version? Thanks! Thanks! I’ve never sent a PDF version before … not sure how to do it. Is it OK if I email you? Hello can you please help me? I have bought your book and read it cover to cover a number of times. I am currently visiting Bangkok and using your guide to search out as many great Thai dishes as I possibly can. I am very keen to visit Gobu Rot Sing. The problem is that the map in the book shows a location kind of close to MBK but the address states it is across the road from NIDA and near Klong Jan (Chan or Jun?) which by my map of Bangkok are quite different locations. I am guessing that the map is possibly not right but I don’t want to make a long trip and not find the delicious Tom Yum noodle soup. Can you please help? I am in Bangkok for a few more days. Thank you Andy. Andy, it’s across the road from NIDA. I’m going to try to email you. Love your blog thanks so much! The book looks so great, please put it out on kindle! Haha. It was hard enough getting it on paper! But you are right; kindle is definitely a future possibility. I got sick eating at one of the stalls you recommended. I am going to sue u! Sorry! Which one was it? Mwahhahahaah! Some people are idiots, but the rest of us think your book is awesome. Thanks for all the hard work you put into it. If anything, I’ll get sick trying to eat all of these great suggestions in one night. Thanks, Dwight 🙂 That’s very kind. that’s a bit of a knee jerk reaction. everyone has a different gastro constitution. you should remember that you are eating on the street and take responsibility for that. i guess in the next reprinting of this awesome book the author will, sadly, need to include a disclaimer. I hope it proves useful! If you have any questions, please drop me a line. Hi, I bought your book yesterday and read through it today. I’m looking forward to trying several of the places. The one point I wanted to mention is that the maps are disappointingly poorly labeled. Numbers next to the stars that correspond to the stalls would be a big help, as would consistent spellings and clearer labels overall. Maybe in ed 2! Thanks all the same. Thanks for your feedback. Alas, I have heard this before, and we are hopefully going to rectify this in our next edition. If you encounter any problems trying to reach someplace, please let me know. I would love to buy your book. It is not available for shippment to canad with amazon. i see your price of b500. is that just shipping? if so what is the total price i will be charged? thank you for your answers. i look forward to this! Hi Greg, 500 baht is the total price, including shipping! Thanks for the inquiry! Your blog is terrific…. we are heading back to Thailand next month and will be sure to pick up a copy of your book. If it’s one thing we love more than most in the world it is Thailand and it’s amazing food. Thank you! I love Thai food too. 🙂 I hope the book enhances your Thai food experience here! Excited to try out some of your recommendations. I’ve been doing something similar on my own for the last few years I’ve lived here but I never wrote my reviews down. But your book would be more effective and probably sell even better if you also offered it as an iBook/eBook through iTunes/Amazon Kindle as the shipping issues would go away and I’d love to take it on some kind of eBook reader to all the different food stalls and compare. Ooops, hit send too quickly. Wanted to add a big thank you for publishing this, it looks like something I will really enjoy. Nicely done! Thanks, Chris! I appreciate your writing me. Online crowd-sourced review updates are something that I definitely want to pursue. I am trying to do something at the moment that will address this, but don’t want to jinx things too much. Things are progressing … slowly … but hopefully there will be something close to what you are describing by year-end! I got a copy of your book at Asia books yesterday at Siam paragon, in travel section, they stock plenty of it. those who would like to grab a copy can go there. Just ordered a copy of your book and gave it a plug on my forum http://www.farangtalk.com. You are most welcome to come over and post in our food section with your expertise and insight would be invaluable to our community. Great blog by the way! Wow, thanks! If you don’t think I sound like an old demented auntie, I’d be happy to do it sometime! hey was wondering if yr book is available in stores here?? havent seen it and am only here for a week on this trip!! It should be at Asia Books and B2S, but if you can’t find it there, go to Orchid Books, Silom Complex, 4th fl. Just ordered your book and I really can’t wait till it gets here (Netherlands) ! Think it’ll be really useful. Thanks a lot for writing it 😉 ! Thanks! Will send your book off tomorrow. Hope you enjoy it! Yesterday I received your book and I really LOVELOVELOVELOVELOVE it ! I finished it at once just as were it a novel 😉 !!! What is the right order of ordering your meal at a foodstall? 1. First you order, wait until it’s finished and walk with your plate to a table. 2. Order your food, walk to a table and wait until they bring the food. Or 3. First go sit at a table, wait until someone comes to take your order and wait again for the food. Lisanne, thank you! That makes my day! If it’s a stand-alone cart, order first there and then sit down. If the stall is a shophouse, sit down and someone will come to you. The good thing is that Thai people are kind and proud of their food, so someone will almost always help you. I will be in BKK next week, hope I can buy a copy and get you to sign it ! LOL ! I love the idea of your book. I was just wondering if you had considered an electronic version of it. With all the ipads, kindles, nooks etc out there, it would be great to just order it from Amazon and just download it right there. We’re working on that at this very moment with someone in SF! He has a lot of great ideas and I’m very excited about it. I am going on amazon.com right now to order this book. So glad I stumbled across it on a Thai blog by Richard Barrow (http://www.thai-blogs.com/2011/01/25/new-book-about-thai-street-food/). Thanks! Great! I’m glad you found us. Love your book! Thanks for sending it. Let me know how I can help you. Email me! Thanks! I will most certainly email you. Looking forward to seeing it at Asia Books. What will be the cover price? Retail price is 390 baht. Can you please advise where this can be purchased in Bangkok. I will be there on 17/02. The book should be in B2S (Central Dept Store bookstores) by then. We have just committed to Asia Books as well; we should be available there from March! Have just received my book in Australia, will spend tonight in bed reading it, can’t wait. Have also put a mention for your on Trip Advisor’s Bangkok Forum, so you may receive a few orders in the next few days. Thanks for a great little book. Cassy, thanks. You are very kind. I really hope you enjoy the book. Had a quick look through and think it is great. Can you bring a vegetarian one out next (I’m vegetarian). This is a good idea. I will make sure to include vegetarian ones too next time. Can’t wait to get my copy! Congratulations! Thanks! It’s winging it’s way to you now. Thanks for dropping the copy off with Jarrett. Have been perusing in great detail and a guest arrives Tuesday evening for two days of food stall crawl. My pleasure! Hope you have a great time exploring. Unfortunately, it won’t be available in book shops until next month. I’m sorry! hi, the book sounds great! since i am already in bangkok is the book available in book shops now? thanks!